Rehabilitation of the dormant Dyckman Street Marina to include recreation, comfort stations and a restaurant. Completion of the Dyckman Ramp, Lighthouse Link and Battery Bikeway of the Hudson Greenway. Reconstruction of the pedestrian bridge at West 181st Street. Construction of a kayak launch on the sand beach at 170th Street. Activation of West Harlem Piers Park as a boat and ferry launch. Restoration of the 79th Street rotunda and fountain court. Rehabilitation of the derelict 69th Street Transfer Bridge as a public pier. Reconstruction of Pier 97 at 57th Street. Development of a multi-use pier including a public market, art gallery and rooftop park at Pier 57. Completion of the esplanade between Laight and North Moore Streets at Piers 25 & 26. Funding will come from a mix of public and private sources. The city will issue RFPs (Requests for Proposals) for more than twenty waterfront development projects totaling $150 million with an eye toward leveraging private investment to support the construction and maintenance of public waterfront space. Council Speaker Christine Quinn, credited with shepherding the plan through to completion, emphasized the 13,000 maritime construction jobs and 3,400 permanent maritime industrial jobs the plan will create, along with the $1.6 million in revenue it will generate annually. She also noted the fuel efficiency of transporting cargo by water, citing a recent study showing that barges are six times more efficient than trucks on a per-ton basis. Industrial projects planned for the next three years include the renovation of the South Brooklyn Marine Terminal and improvement of rail-to-barge access points at the Rail Yard in Sunset Park, Brooklyn. On the green front, the plan allocates $50 million to waterfront restoration projects such as the Bronx River Greenway and more than a billion in upgrades at six wastewater treatment plants. All projects will be subject to new city guidelines for planning, design, construction and maintenance developed and overseen by City Planning Commissioner Amanda Burden, known for her exacting standards for developers. 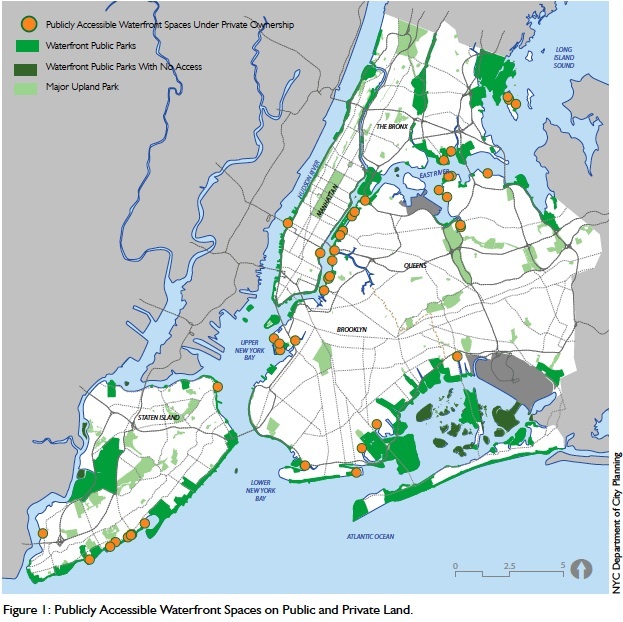 View a new citywide map of publicly accessible waterfront spaces here.